So guess what everyone... I learned how to tether my internet from my phone through the USB!!! I thought that was something we would have to pay extra for but apparently you only have to pay extra to tether wirelessly. So anyway, I may blog more now that I don't have to type the whole thing from my phone. Now that I gave you all the good news, I guess I'll give you the bad news. Luke had a febrile seizure yesterday. It was really scary. I'd never seen a seizure in person before and I had never seen what happens after a seizure and it was all so sudden. Luke is doing fine now and Tyler and I are too. I keep having flashbacks which make me feel emotional randomly, but apart from my anxious paranoia over whether he's ok or not... I'm ok. Here's what happened. Luke has been having an on and off cough, runny nose, low grade fever thing for a couple weeks now but it has never gotten bad enough to make me think he was really sick. He hasn't really acted sick, so I mostly figured it was because he seems to be trying to cut he 2 yr old molars. The night before last he woke up at 2:30 am and when I picked him up to take him back to bed he seemed a little warm. I wondered if he had a little fever or if he was still just warm from being under his blankets. I rocked him in the rocking chair for a minute and he seemed to cool off so I thought it was the latter of the two and put him back in bed. He had asked for a drink of milk so I went to get it and when I got back in his room he was asleep again. An hour later at 3:30 am he woke up again and this time he felt like he had a fever and it didn't go down after rocking for a few minutes. I noticed he smelled like poop so I took him out and changed his dirty diaper and then gave him some ibuprofen and the milk he had asked for an hour earlier. He went back to bed after that and Tyler and I woke up at 8:30 pleasantly surprised that we got to sleep in. Luke usually wakes up at 7 at the latest these days. So Tyler decided he would stay home with Luke and I took Dax and went to church.... a little late (we have 9:00 church). When I got home from church Tyler told me Luke had slept until around 10. He only does that when he isn't feeling well. He seemed pretty lethargic. He would talk and sometimes get up to get something but mostly he just sat with Tyler on the couch watching Bob the Builder. I got Dax down for a nap and made myself some lunch. While it was cooking I was sitting on the couch across from Luke and Tyler, and I asked Luke if he was feeling sick. He mumbled something in Lukish and then said something about dad and said "hi mom" to me and then went on watching Bob. That's a pretty normal response. I got my lunch and sat back down on the couch and started eating it when all of a sudden Tyler frantically said, "Luke?! Lucas?" I looked up and saw Tyler sliding off the couch down to kneel in front of Luke. He was gently patting Luke's cheeks and rubbing his head and asking Luke to come back, stay with him and he continued to say Luke's name. As I ran over to see what was going on I saw Luke's eyes were starring off to his right side and his jaw was clenching and unclenching and his hands were in fists jerking toward one another as though he was clapping and his whole body was twitching. It was horrific as a parent to watch, not knowing how to help your child as they go through something like that. So I called 911 as Tyler continued to talk to Luke and the dispatcher lady had to ask me for my address twice because the first time I was trying to calm down and I got the address all jumbled up as I tried to spout it off. The dispatcher talked me through somethings, like to lay him on his side so he wouldn't choke on saliva or vomit should he throw up after the seizure. Luke then stopped jerking and it was like he instantly fell asleep. I was sure he was falling into a coma. He was unresponsive and it was possibly scarier than the actual seizing. The dispatcher had me tell her every time he took a breath to check to see if his breathing was regular. He started moaning on the exhale. We did that for a minute and she told me it was normal for a person, especially a small child, to fall asleep immediately following a seizure because it is so exhausting for the body. She said the paramedics would be there any minute and told me to put any animals away. It's a good thing she said that because I hadn't thought of our dogs who were in the back yard. It wouldn't have been fun to try to get them to calm down with all those paramedics, so I closed the doggy door. At this point Luke was starting to wake a little and was upset and crying. I saw the ambulance pass and went outside to meet the paramedics and the dispatcher then turned me over to them and we got off the phone. The paramedics came in and started checking him out. They checked his pupils, temperature (which was 101 degrees f) pulse, blood sugar, and probably a few other things. They asked us to fill them in on his medical history and what had just happened. They said that his being upset and crying was a good sign and that if he weren't then they probably would have just put him in the ambulance and taken him to the hospital immediately. After talking for a bit they said everything seemed to point to a febrile seizure which they explained saying that if the body's temperature very suddenly rises or spikes then it can be too much for a little body and they will have a seizure like Luke did. They said we didn't have to take him to a doctor or the ER but that it wouldn't be a bad idea and it might be best. 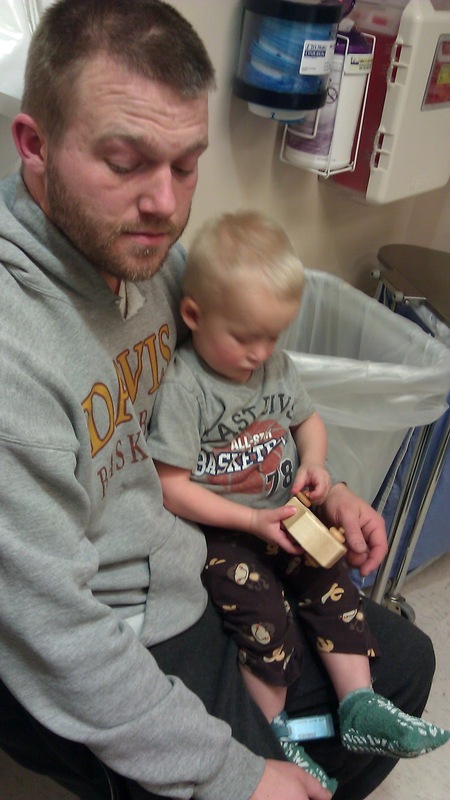 We loaded up the car and drove him to McKay Dee Hospital in Ogden and went to the ER. 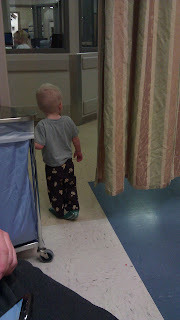 It is interesting to me to think that we took Luke to that same ER almost a year ago when he split his head open and needed stitches. I guess he just doesn't like the months around his birthday. So once we got to the triage in the ER they got his info and took his vitals and sent us in. We didn't have to wait in the waiting room like we did last year. I was so grateful for that! The doctor came in and got the same info from us that the paramedics had asked for and came to the same conclusion. They gave him a dose of ibuprofen and had us wait for an hour so they could monitor Luke's behavoir and make sure he didn't have any side effects from the seizure. Luke just sat in the chair next to Tyler for a while and looked around.... That's how you can tell if Luke doesn't feel good, he sits still for more than 2 seconds. They told us we could keep the syringe they used to give him the ibuprofen since Luke was interested in playing with it. He started pulling it apart and putting it back together... very normal for him. He then turned around and noticed the holes in the frame of the hospital bed and I could practically see the wheels turning. He walked right over to them and started putting the syringe in each one. I think that was a good sign that he saw it and associated the two shapes and put them together like a puzzle. When he got done with that project he decided to just stand at the curtain and watch what was going on. Right before we left he was really getting annoyed that he couldn't leave the sectioned off area and a male nurse came walking in with a little wooden car for him. He liked it a lot. Before we left the ER doctor said that children who have a febrile seizure are more likely to have another if the get the same virus again or any time they get a fever because it could spike again. He said to watch his temperature and give him Tylenol and Ibuprofen alternating to keep his fever down. My parents came up after we got home to adjust Luke and give him laser therapy (also here). Before they left we asked my dad to help give Luke a blessing which he was surprisingly tolerant and patient through. He even folded his arms and let them place their hands on his head. At midnight Luke woke up with a fever. I took him into the kitchen and sat him on the counter while I got the Ibuprofen ready (not the smartest place for him I know but I was still out of it). He was very talkative and suddenly he kicked his leg out and from the corner of my eye I thought it was him having another seizure. I'm pretty sure my heart stopped for the amount of time it took me to look from the medicine to Luke and realize he was just kicking his leg for fun. Every sudden movement or unexpected sound made me jump. I took his temperature under his armpit and it stopped at 102.7! I took Luke in to our bedroom and he sat on our bed and talked to us at a rate of about a million words per minute. He was practically hyper. I tried to feel his pulse and he wouldn't let me so I just put my hand on his chest, his heart felt like it was pounding very fast. We took his clothes off in the hopes that it would help him keep from getting too hot. We tried to get him to relax with us and sat there waiting for his fever to break. After probably an half an hour, his talking slowed down slightly so I took his temperature again, it was 101.2. Finally it was going down so Tyler tried to take him back to bed. He was still acting hyper and wouldn't stay in bed so Tyler brought his pillow and things into our room and we did a rare thing and let him get in bed with us (partially for our own peace of mind). Tyler couldn't sleep because when Luke finally stopped talking and fell asleep, he was right on top of Tyler. So Tyler got up and went to "sleep" on the couch... which didn't do much for him either. Today Luke has been fairly normal. He whines a lot and cries more easily than normal but other than that he seems normal. I don't get it, but I'm so grateful it wasn't more serious and that he isn't hurt or stuck in the hospital. He is such a sweet boy and I'm blessed to have him and Dax here. So, to anyone who has never heard of a febrile seizure, read up on it and know about it in case your child is one of the 1%-4% who will have one before they are 5 years old. I had never heard of it but the doctor and paramedics all said it is very common and not to worry too much and that Luke will grow out of it. Sorry, but it was really scary, no matter how common it is and I might not have been so traumatized if I'd known about the possibility before it happened! any time a child of mine was ill I would do as you did - keep him close and watch him take a breath etc. Love you and hope Luke stays well!!!!!! Wow, so scary. Glad he's ok. Hope he is feeling better quick. Oh my gosh how scary! I'm so glad he is ok. Hope he continues to recover we are thinking about you guys! Man, I teared up just reading that. It's so scary when your kids are in trouble like that. Grant had a fever, cough, lethargic, low oxygen levels, and a little delirium this week too, so we had him sleep in our room so we could keep an eye on him...which meant no sleeping for us. Those scary moments stay with you for a while, my heart goes out to you guys! Glad he is okay! Call me if there is any way we can help! Bre I am so glad that he is ok. You are one tough Mama to handle things as well as you do!! I hope he stays feeling better, and that you will be ok too! Yuck yuck yuck! Hope little Luke is doing better! 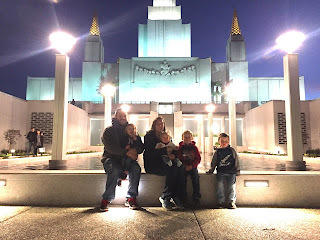 I really need to update this blog! look at this recent photo! the cover photo is missing my 2 beautiful girls! I 'm grateful for my eternal family! So it has been a year and a half since the last time I posted! Sorry! Our lives have been a little crazy, but those things are for a different day. Today I have a minute so I want to type up DeLayna's birth story. Surprise! I was pregnant during and had another baby since the last time I post! haha! Well it has been an extremely long time since I last posted! I apologize. Things have been really crazy in our home! We've been doing a lot of renovations trying to get our house ready to list for sale and we wanted to get most of them done before Baby Lacey joined us. I'll post about those things another day. Today I want to tell you the story or Lacey's birth. 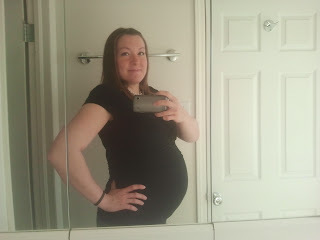 Here I am at 34 weeks pregnant. I was much bigger when she finally decided to be born but I didn't take any other pictures.